You read or heard Rett’s Syndrome as part of the broader autism spectrum disorder or pervasive developmental disorders. But what exactly is Rett’s Syndrome? Rett Syndrome (RTT) is a neurodevelopmenal disorder that affects girls almost exclusively. It is characterized by normal early growth and development followed by a slowing of development, loss of purposeful use of the hands, distinctive hand movements, slowed brain and head growth, problems with walking, seizures, and intellectual disability. This disorder is included under the ICD-10’s Pervasive Developmental Disorders category and was formerly included in the DSM-IV list of developmental disorders but was now removed under the DSM-5 because of its molecular causes. The disorder was identified by Dr. Andreas Rett, an Austrian physician who first described it in a journal article in 1966. It was not until after a second article about the disorder, published in 1983 by Swedish researcher Dr. Bengt Hagberg, that the disorder was generally recognized. Rett Syndrome is almost exclusively affects females but has also been found in male patients. Rett Syndrome is genetic. It is caused by mutations in the gene MECP2 located on the X chromosome, and can arise sporadically or from germline mutations. In less than 10% of RTT cases, mutations in the genes CDKL5 or FOXG1 have also been found to resemble it. Rett syndrome was initially diagnosed by clinical observation, but the diagnosis is definitive when there is a genetic defect in the MECP2 gene. In some very rare cases, no known mutated gene can be found suggesting changes in MECP2 that are not identified by presently used techniques or mutations in other genes that may result in clinical similarities. Neurotransmitter (brain chemicals that regulate brain and body functions) deficits are also causes of Rett Syndrome like pontine noradrenergic deficits caused by genetic loss of MECP2 changes the properties of cells in the locus coeruleus, the exclusive source of noradrenergic innervation to the cerebral cortex and hippocampus, and midbrain dopaminergic disturbances where dopamine synthesized by nuclei located in the mesencephalon is dysregulated. Initial development is normal. Onset occurs between 6 and 18 months of age. During this time there are subtle developmental deviations and early indicators of Rett syndrome. A period of developmental stagnation is followed by developmental regression where language and motor milestones regress, purposeful hand use is lost, and acquired deceleration in the rate of head growth (resulting in microcephaly in some) is seen. Hand stereotypes are typical, and breathing irregularities such as hyperventilation, breathholding, or sighing are seen in many. Early on, autistic-like behavior may be seen. However, closer scrutiny reveals disturbance of the normal spontaneous limb and body movements that are thought to be regulated in the brainstem. The brief period of developmental progress is followed by stagnation and regression of previously acquired skills. During regression, some features are similar to those of autism. It is, hence, easy to mistakenly diagnose Rett syndrome for autism. Occasionally, Rett Syndrome shares a lot of symptoms with autism and cerebral palsy, making it difficult to diagnose and rule out from other disorders. Stage I (Early Onset) – typically begins between 6 and 18 months of age. This stage is often overlooked because symptoms of the disorder may be somewhat vague, and parents and doctors may not notice the subtle slowing of development at first. The infant may begin to show less eye contact and have reduced interest in toys. There may be delays in gross motor skills such as sitting or crawling. Hand-wringing and decreasing head growth may occur, but not enough to draw attention. This stage usually lasts for a few months but can continue for more than a year. Stage II (Rapid Destructive Stage) – usually begins between ages 1 and 4 and may last for weeks or months. Its onset may be rapid or gradual as the child loses purposeful hand skills and spoken language. Characteristic hand movements such as wringing, washing, clapping, or tapping, as well as repeatedly moving the hands to the mouth often begin during this stage. The child may hold the hands clasped behind the back or held at the sides, with random touching, grasping, and releasing. The movements continue while the child is awake but disappear during sleep. Breathing irregularities such as episodes of apnea and hyperventilation may occur, although breathing usually improves during sleep. Some girls also display autistic-like symptoms such as loss of social interaction and communication. Walking may be unsteady and initiating motor movements can be difficult. Slowed head growth is usually noticed during this stage. Stage III (Plateau or Pseudo-stationary Stage) – usually begins between ages 2 and 10 and can last for years. Apraxia, motor problems, and seizures are prominent during this stage. However, there may be improvement in behavior, with less irritability, crying, and autistic-like features. A girl in stage III may show more interest in her surroundings and her alertness, attention span, and communication skills may improve. Many girls remain in this stage for most of their lives. Stage IV (Late Motor Deterioration Stage) – can last for years or decades. Prominent features include reduced mobility, curvature of the spine (scoliosis) and muscle weakness, rigidity, spasticity, and increased muscle tone with abnormal posturing of an arm, leg, or top part of the body. Girls who were previously able to walk may stop walking. Cognition, communication, or hand skills generally do not decline in stage IV. Repetitive hand movements may decrease and eye gaze usually improves. Image courtesy of bryanking.net. 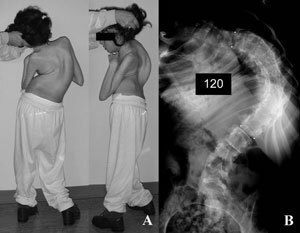 A girl with Rett Syndrome has scoliosis as one of its symptoms. Genetic testing is also done to rule out Rett Syndrome by seeing if there is a broken or mutated MECP2. There is also a criteria for diagnosing Rett Syndrome. How is Rett Syndrome managed? There is no cure for Rett Syndrome, but studies have shown that restoring MECP2 function may lead to a cure. One area of research is in the use of Insulin-like Growth Factor 1 (IGF-1), which has been shown to partially reverse signs in MeCP2 mutant mice. Other therapeutic intervention is to counter the neuroexcitotoxic effect of increased spinal fluid levels of a neurotransmitter called glutamate and increased NMDA receptors in the brain of young Rett girls. Dextromethorphan, an antagonist of the NMDA receptor in those below the age of 10 years, is also used. occupational therapy, speech therapy and physical therapy (for children with Rett syndrome). Because of the increased risk of sudden cardiac death, when long QT syndrome is found on an annual screening EKG it is treated with an anti-arrhythmic such as a beta-blocker. There is some evidence that phenytoin may be more effective than a beta-blocker. What is the outcome for Rett Syndrome? Rett Syndrome is a rare disease. 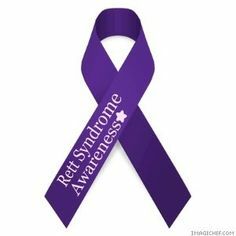 The incidence of Rett Syndrome is estimated at 1 in 10,000 females. But why Rett Syndrome is more common in girls than boys? Though Rett Syndrome is a genetic and developmental disorder, it occurs more in girls than boys. Girls have two X chromosomes in every cell. If they have Rett syndrome, some of the cells will use the defective gene. Other cells will use the healthy genes which will help to make up for the cells using the defective gene. However, boys only have one X chromosome in every cell. They lack the extra X chromosome that can protect their bodies from being completely overcome by the disorder. Therefore boys with the cell mutation that causes Rett syndrome often die before or shortly after birth. Because Rett Syndrome is a rare yet one of the most debilitating genetic and developmental disorders, awareness and acceptance of Rett Syndrome is spread around the world. October is designated as Rett Syndrome awareness month and violet is the color symbol of RTT. Despite difficulties associated with Rett, girls ho have it deserve to live a good life, cared for, and be respected. Rett A (September 1966). “[On a unusual brain atrophy syndrome in hyperammonemia in childhood]”. Wien Med Wochenschr (in German) 116 (37): 723–6. PMID 5300597. Hokfelt T, Martensson R, Bjorklund A, Kleinau S, Goldstein M (1984). “Distribution maps of tyrosine-hydroxylase-immunoreactive neurons in the rat brain”. In A. Bjorklund and T. Hokfelt. Handbook of Chemical Neuroanatomy. Classical Transmitters in the CNS, Part I 2. New York: Elsevier. pp. 277–379. Berridge, Craig W; Waterhouse, Barry D (2003). “The locus coeruleus–noradrenergic system: Modulation of behavioral state and state-dependent cognitive processes”. Brain Research Reviews 42 (1): 33–84. doi:10.1016/S0165-0173(03)00143-7. PMID 12668290. Jessica Wright (12 April 2013). “Clinical research: Rett symptoms emerge early, gradually”. SFARI.org. Retrieved 6 April 2014. “Autism-like disorder ‘reversible'”, BBC News, 8 February 2007. Tropea, D.; Giacometti, E.; Wilson, N. R.; Beard, C.; McCurry, C.; Fu, D. D.; Flannery, R.; Jaenisch, R.; Sur, M. (2009). “Partial reversal of Rett Syndrome-like symptoms in MeCP2 mutant mice”. Proceedings of the National Academy of Sciences 106 (6): 2029–34. doi:10.1073/pnas.0812394106. PMC 2644158. PMID 19208815. Blue, ME; Naidu, S; Johnston, MV (1999). “Development of amino acid receptors in frontal cortex from girls with Rett syndrome”. Annals of neurology 45 (4): 541–5. doi:10.1002/1531-8249(199904)45:43.0.CO;2-2. PMID 10211484. McCauley MD, Wang T, Mike E et al. (December 2011). “Pathogenesis of lethal cardiac arrhythmias in Mecp2 mutant mice: implication for therapy in Rett syndrome”. Science Translational Medicine 3 (113): 113ra125. doi:10.1126/scitranslmed.3002982. PMC 3633081. PMID 22174313.